Medical treatment, despite our own Western perspective of science, is a cultural trait. How we choose to treat different forms of trauma, the methods of recovery, and the beliefs surrounding medicine are all culturally dictated. In our own society there are constant debates over the necessity to get certain vaccinations, whether one should be active or in bed during certain sicknesses, the actual efficacy of chicken noodle soup, or if the entire thing could be healed simply by being less ‘stressed’. We rely on science and popular belief, which change drastically over time. There have long been debates over the changes that occurred in health with Romanization. Examination of skeletal remains have shown both improvement and decline in overall health. A study by Redfern (2010) takes a different approach and looks at the cultural change in medical beliefs and practices through physical remains. evidence of ante mortem fractures and surgical practice in Dorset. The goal was to assess changes in treatment from the Iron Age (5th c. BCE to 1st c. CE) to the Romano-British period (1st c. to the end of the 4th c. CE). It is assumed that the Romans brought some semblance of science and progress to these barbarian cultures, but new analysis shows this isn’t necessarily true. The analysis of healed fractures requires careful assessment of the bones. When a fracture heals the remodeled bone can be obviously altered, especially if the bone doesn’t set correctly, or only slightly expanded if the healing is good. Examining surgery is harder as the distinction between a surgical tool and weapon can be difficult, and requires attention to details around the injury. Other forms of healing done to the soft tissue or through herbal remedies cannot be determined from the skeletal remains. Other evidence of medical intervention can be helping in understanding treatment in the past and changes in medicine. 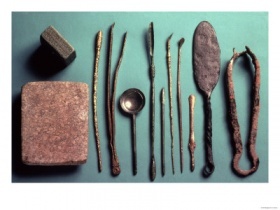 In Iron Age German sites they found probes, retractors and bone saws that would have been used in surgery. In Essex they found an Iron Age doctor’s burial which included scalpels, hooks, spring forceps, saw, needles and a scoop probe. Herbs and spices found in the grave may also be indicative of herbal remedies. Evidence of Roman medicine is much richer including medical texts, instruments, inscriptions and depictions. However, most of these are found within the Mediterranean. Roman medical equipment is found in Britain, but it is primarily located at military sites and it isn’t known whether the average individual would have had access to this type of care. In order to assess healthcare and change, Redfern examined 270 sexed adults and 190 subadult individuals dating from the 5th c. BCE to the end of the 4th c. CE. From the Iron Age there were 64 males, 51 females and 80 subadults. From the Romano-British period there were 96 males, 59 females, and 110 subadults. Individuals were taken from 21 cemeteries around the Dorset region. She recorded fractures based on location, type of fracture, healing, and whether it resulted in deformity (change in angle, rotation, shortening or bones rebuild next to rather than end to end) or associated degenerative problems like arthritis. Surgical treatment was identified based on the type of trauma, presence of cut-marks, and presence of surgical artifacts. Within the Iron Age population she found that there were a number of high risk fractures (those that would be difficult to heal or possibly cause nerve damage) that were well set and didn’t develop infection. This suggests that the medical practitioners were able to effectively cope with a wide range of traumas. Non-union was only present in one individual, which likely means most individuals were given proper care and rehabilitation after the fracture. There was also only one individual who displayed apposition (where fracture bones heal next to one rather than properly end to end), which means that splinting of bone was highly likely to hold the break in place and properly set it. In the Roman period there is an increase in healed fractures that are deformed. This doesn’t necessarily mean that the medical knowledge decreased or practitioners were worse, but may be a sign that individuals were not given proper rehabilitation time. There is an increase in the number of surgeries, with a variety of trepanations and amputations occurring in the Roman period. The research on fractures shows that both Iron Age and Romans knew how to properly treat this types of injuries. With conquest there is not a drastic change in individual health or treatment of fractures, but there is increased surgery which likely meant introduction of new knowledge. This study is quite interesting because it adds to the story of Romanization, changing it from one of a civilizing process to one of the rise of a new syncretic culture.